Chinese and American paleontologists reported on Wednesday in the journal Science Advances the discovery of earliest animal fossil footprint ever found. The fossil footprints for animal appendages was made in the Ediacaran Period, about 635 to 541 million years ago in China, according to the study. Bilaterian animals such as arthropods and annelids have paired appendages or "legs" and are among the most diverse animals today and in the geological past. They are often assumed to have appeared and radiated suddenly during the so-called "Cambrian Explosion" about 541 to 510 million years ago, but scientists now tend to consider that their evolutionary ancestry was rooted in the Ediacaran Period. Until the current discovery, however, no fossil record of animal appendages had been found in that period. 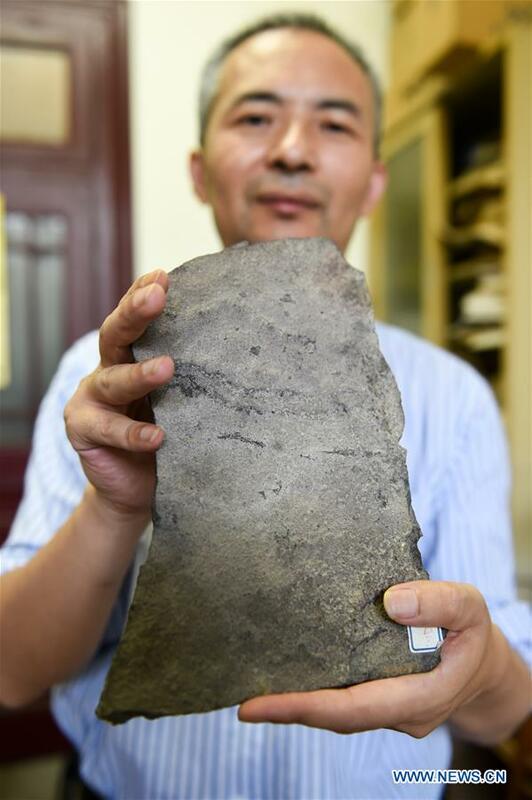 Researchers from the Nanjing Institute of Geology and Palaeontology under the Chinese Academy of Sciences and Virginia Tech in the United States studied trackways and burrows discovered in the Ediacaran Shibantan Member of the Dengying Formation (551 to 541 million years ago) in the Yangtze Gorges area of southern China. The trackways are somewhat irregular, consisting of two rows of imprints that are arranged in series or repeated groups, according to the study. The characteristics of the trackways indicated that they were produced by bilaterian animals with paired appendages that raised the animal body above the water-sediment interface. Also, the trackways appear to be connected to burrows, suggesting that the animals may have periodically dug into sediments and microbial mats, perhaps to mine oxygen and food. These trace fossils represent some of the earliest known evidence for animal appendages and extend the earliest trace fossil record of animals with appendages from the early Cambrian to the late Ediacaran Period. The body fossils of the animals that made these traces, however, have not yet been found.